Thinking back, the signs were there – family photos burned in the fireplace, Mother sewing her best silver and jewelry into the lining of her coat at night, and Papa not returning from work. My younger brother, Jonas, was asking questions. I asked questions, too, but perhaps I refused to acknowledge the signs. Only later did I realize that Mother and Father intended we escape. We did not escape. I have never been more riveted by a first paragraph than I was with Between Shades of Gray. Talk about a book that pulls you in from the very beginning! Lina is fifteen years old in June of 1941 when the Soviet NKVD (secret police) come and take her family from their Lithuanian home. They are sent across the frozen tundra of Siberia to a prisoner work camp where they are forced to brave the cruelest of elements. Lina's only relief from her deplorable surroundings is in her art, risking her life to document events and messages she hopes will make their way to her father. 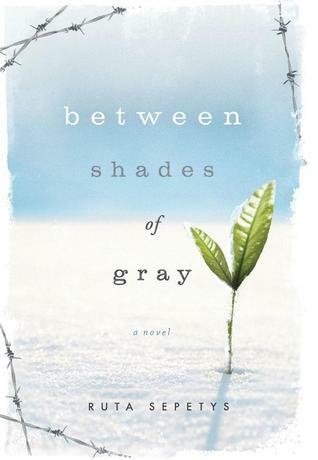 This is a story that needed to be told and Ruta Sepetys did it with such love and care for her family's history. While Lina is a fictional character, Sepetys was inspired by her own family history when writing Lina's story. 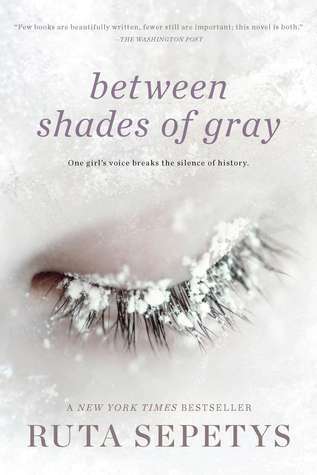 The tag line of the newly designed cover is "One girl's voice breaks the silence of history." I am not usually a fan of tag lines on covers because they're usually really generic and cheesy, but this one so perfectly captures the spirit of this novel that I actually wish the tag line were more prominently displayed. Most people are not aware of Stalin's systematic deportation of Lithuanians during World War II. It is literally a part of history that Sepetys brought to light by writing this novel. Yet another reason why reading enriches our lives: even though this is a work of fiction, it still manages to educate and enlighten.This is definitely one of the best historical fictions I have ever read. The world is better for having this book its midst. It's one that should be taught in high school literature and social studies classrooms. Check out this interview with Ruta Sepetys where she talks about her inspiration for writing the book. It's eleven minutes long but it's worth taking the time to watch. It's one of the most fascinating author interviews I've ever watched. I absolutely loved this book! Great review! Wonderful review. I loved this one, too. Thanks for including the author interview! I'm hoping that one day I can get bookshelves in my classroom with these sorts of books. I would love that! This book sounds very interesting & I don't know why I haven't read it yet. Great review! What a great review. This sounds like a MUST READ. I'm going to go request it from my library right this minute :) Thanks! I loved this book. It was my favorite last year. I keep hearing how good this one is--I am looking forward to it lots! Apart from the crying part...which will probably happen to me too!